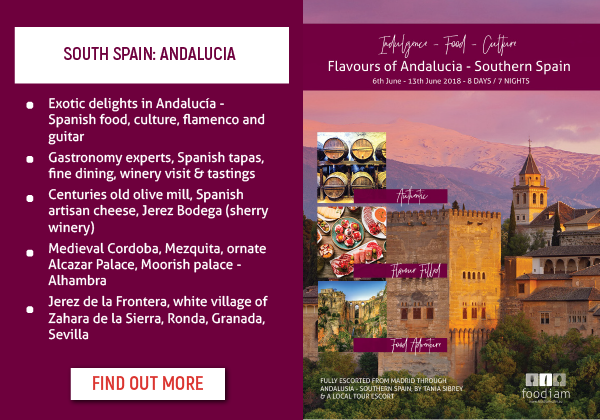 A wonderful food journey through different regions of Spain including inspiring authentic dishes from regions including Asturias, Cataluna and Cordoba. A fantastic selection of tapas and paella each having a little history of their own. Learn the techniques and simplicity of each dish and how to balance the flavours and spice used in Spanish cooking. Tortilla de vegetal - Potato tortillas filled with lettuce, onion, tomato, tuna and aioli. This type of tortilla is found in the Pintxos bars of Northern Spain. Croquetas jamon y queso - Jamon and cheese croquettes, crumbed and fried. This type of croquette is found in both Pintxo and Tapas bars all around Spain. Made with both jamon and cheese in a creamy bechamel filling. Brocheta de cerdo - Pork shoulder skewers marinated in Moorish spices (paprika, cumin, coriander and fennel- all spices common to Southern Spain) served with labneh, cilantro and pickled green chillies. Paella de marisco - Seafood Paella. The most popular type of Paella consumed around Spain in both bars and in the home. Torrijas – Torrijas, a Spanish style French toast, served as a postre (dessert). First the bread is soaked in a milk infusion then dipped in eggwash and fried, served with a honey syrup and vanilla cream. Traditionally an Easter dish, but also eaten all year round. Amy's credentials from hatted establishments are many, afterspending three years with Frank Comorra “Movida” as Senior Chef de Partie she then moved onto her current position with Matt McConnell as Sous Chef at award winning “Bar Lourinha”.